During the ongoing partial government shutdown, federal employees fall into three buckets: those who are furloughed, those who are working without pay and those whose agencies are funded and are working—and receiving their paychecks—normally. 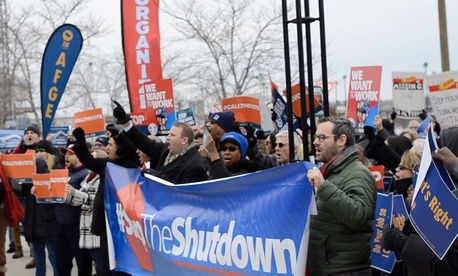 Workers from all three of those buckets gathered in Washington, D.C., on Thursday, the 27th day of the shutdown, to put pressure on lawmakers to reopen agencies. Stephanie Graf works at the Labor Department, which has already received its full fiscal 2019 appropriations. Graf is not at risk of missing any paychecks. Still, she took leave from her job and joined the rally out of a sense of solidarity for those who are not receiving compensation. She no longer wants to feel like she is getting lucky compared to the rest of her federal colleagues. “I don’t feel guilty as a worker, I feel guilty as an American that any American does not see this as wrong, as shameful and something that we all need to protest against,” Graf said. One of those employees is Rachael Weatherly, a senior policy adviser at the Federal Emergency Management Agency. She has bills coming due Feb. 1, and is currently determining which she is going to pay and which she will attempt to defer. Employees were not just concerned about their own bottom lines. Weatherly works in FEMA’s resilience office where she helps oversee preparedness activities, planning and grants. Her office is not processing grants to help state and local governments prevent terrorist attacks, nor is it conducting exercises or planning for hurricane season. Maxwell Sanborn is an engineer at the Consumer Product Safety Commission who is home on furlough. He has enough savings to get by for now, but knows that many of his colleagues do not. He is most worried, however, about not being in his laboratory to test products coming into the country. John Cherry is working through the shutdown as a financial coordinator with the Office of Personnel Management. His office helps to run training sessions for human resources specialists and Senior Executive Service members. Some of the training centers have been shut down entirely, while other courses that have continued are sparsely attended because those who would otherwise be there work at shuttered agencies. Several of the employees at the rally who also work for their unions said they have heard from colleagues soliciting help in getting loans, looking for food banks, paying rent and mortgages, or finding daycare for their children. Some workers are nearing a breaking point. Weatherly, the FEMA employee, is one of those. She does not typically get involved in political protests, but thought the shutdown was too important an issue to remain on the sidelines.